German Immigrants in American Church Records - Vol. 19: Missouri (excluding St. Louis County); Edited by Roger P. Minert; Ph.D., A.G.; 2016; 761 pp; Hard Cover; Every-name index; Acid Free Paper; ISBN 978-1-62859-093-7; Item #FR0653. 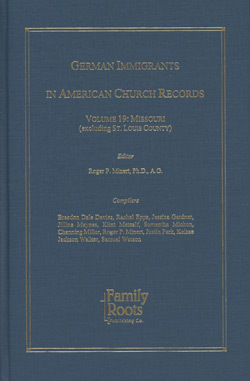 A 5,879 surname Index, compiled from 18,563 entries found in this book - German Immigrants in American Church Records, Vol. 19, is found at the end of this entry. Elisabeth Jacke b. Niderwil, Zofingen, Switzerland 29 March 1829; d. Berger, MO 29 Dec 1894; bur. Berger 31 Dec 1894; m. - - Lauer. Ref: Deaths 1894. Carl Heinrich Ludwig Bruening b. Haarburg, Sachsen (province) 7 Aug 1827; d. Berger, MO 15 Jan 1895. Ref: Deaths 1895. Johanne Louise Horstmann b. Brockhagen, Westfalen 12 Oct 1837; d. Berger, MO 1895, age 57-7-12; m. 1869, Karl Kautz. Ref: Deaths 1895. The first 18 volumes of this ongoing series were published by Lewis Rohrbach of Picton Press. Following his death, Family Roots Publishing contracted with Dr. Minert to continue publication of the series - starting with this volume, which deals with Missouri church vital records. The follow is the table of contents (excluding page numbers) for the volume. The following 5879 surnames are found in 18,563 entries in this volume.